Fresh tabbouleh flavors get an added boost of protein from chickpeas, feta cheese and whole wheat pasta to make this a delicious side dish or entree salad. Happy Monday Everyone! Today is the big day – I am in Los Angeles to attend the Live Finale of Biggest Loser Season 14!!!! I am counting down the minutes until I get to see Jillian, Bob and all of the contestants from past seasons up close and personal!! Ok, calm down Liz. To help me out while I’m quickly trying to lose 20 lbs and get a spray tan before showtime, I’ve invited my friend Julia from A Cedar Spoon to guest post. Not only are we both mothers of toddler boys but we both come from Middle Eastern families and have garlic, lemon and olive oil running through our veins. Once you check out Julia’s blog I know you’ll fall in love with her incredible recipes including Kibbeh Meatballs with Spiced Yogurt Sauce, How to Make Baklava and Homemade Yogurt (Laban). Without further ado…. welcome Julia! I’m Julia from A Cedar Spoon and am honored to be guest posting for Liz while she is traveling. Liz is a true inspiration to me. Her blog offers healthy, delicious recipes that inspire me to try new foods and continuously think about the choices I make when eating. Her fitness ideas and tips are also a huge motivation (especially on those days that I just don’t feel like going to the gym). Liz and I both come from Middle Eastern families where Middle Eastern food is the center of our gatherings, whether it is talking while digging into hummus, or passing around plates of kibbeh, fattoush and baba ghanoush. Today’s recipe that I am sharing with you is a Middle Eastern favorite of mine with a little twist. 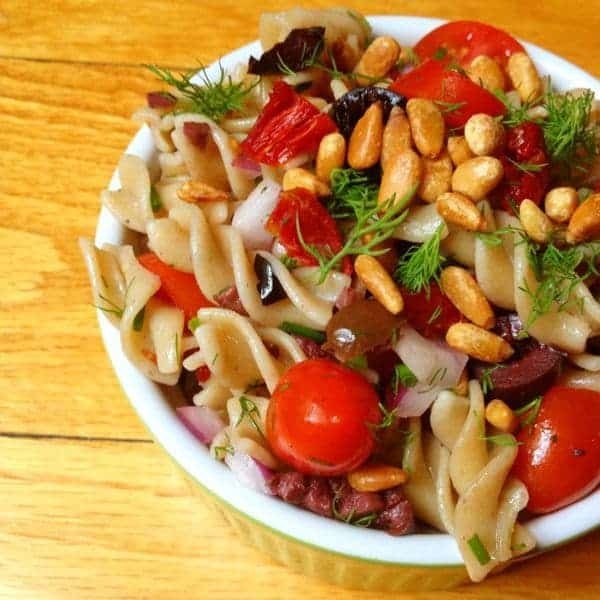 This Tabbouleh Whole Wheat Pasta Salad is inspired by one of my favorite salads at Trader Joes. 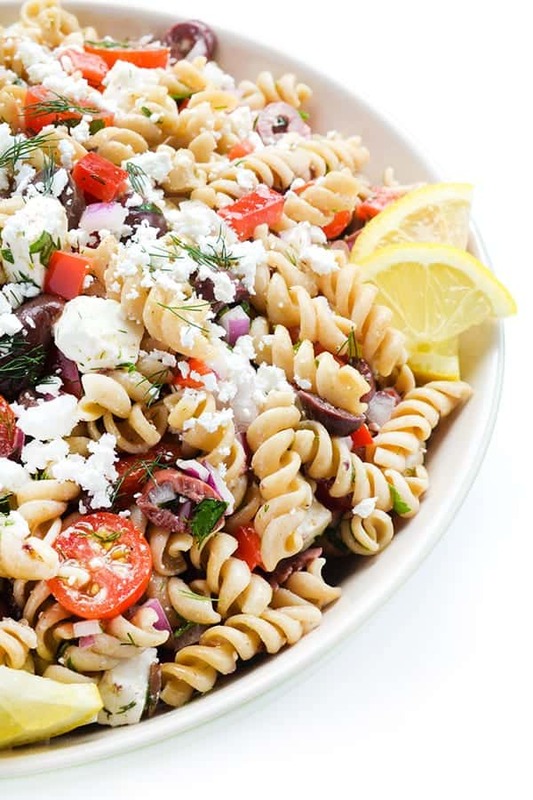 It mixes the traditional tabbouleh (minus the bulgar wheat), chickpeas, feta cheese and whole wheat pasta with a light lemony vinaigrette that is perfect for picnics, lunch or dinner. The extra-virgin olive oil used in the dressing is made up of monounsaturated fatty acids (healthy fats) which helps to lower your risk of heart disease. The chickpeas are full of protein, fiber and are loaded with vitamins and minerals. Lemon juice offers your body vitamin C and potassium helping to keep your immune system healthy. 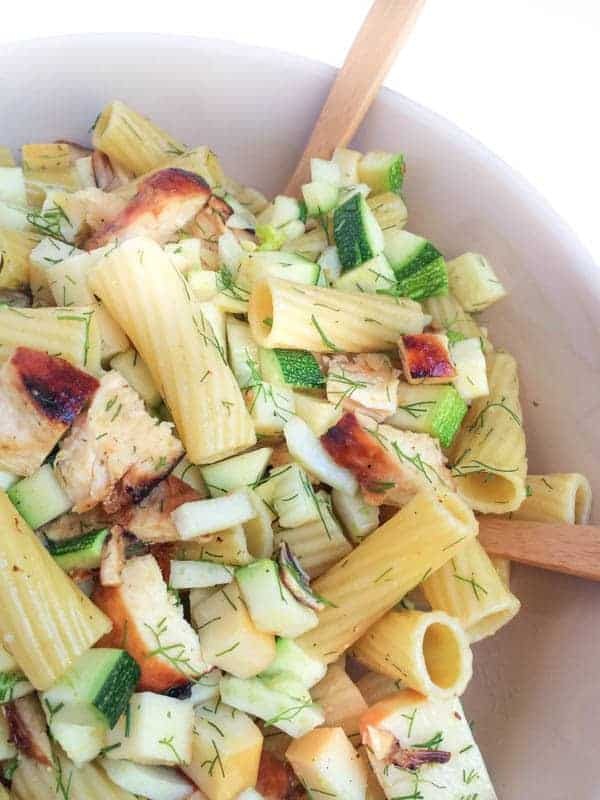 As with many salads you can modify this to your tastes by adding vegetables like cucumber or red pepper, or using vegetable pasta instead of whole wheat pasta. Salads offer a chance to be creative in the kitchen. 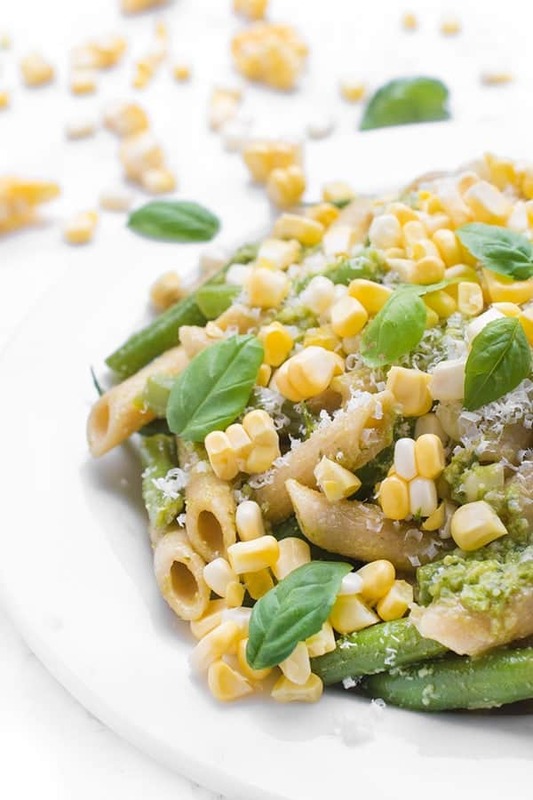 By the second day you will notice the salad starts to lose the lemony taste because the pasta is soaking up the dressing. Add a little olive oil and lemon until the salad has the flavor you want. I hope you get the chance to make this for your next family gathering or as a healthy lunch option. Cook the pasta according to package. Drain and run under cold water to stop the cooking and set aside. Chop the tomatoes, parsley, green onion and place in a large mixing bowl. Add the chickpeas and feta cheese and mix together. Set aside. In a small mixing bowl whisk together the lemon juice and extra-virgin olive oil. Slowly pour the lemon dressing over the salad and toss to combine. Place the salad in the refrigerator for 30 minutes to let the flavors soak into the salad. 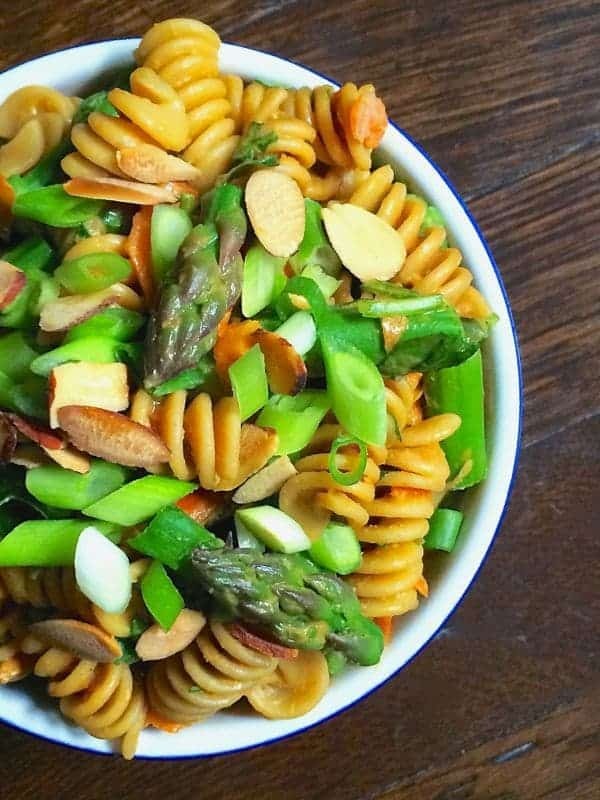 Add the pasta into the salad and mix well. Add salt and pepper to taste and serve. Feel free to substitute whatever pasta you like. Add vegetables like cucumber, green or red pepper or radishes. Save the other ½ of the can of chickpeas in the refrigerator to use during the week to garnish salads. I have made this twice in the past week, and it is absolutely AMAZING. I will make it over and over again. It is perfect as part of a light lunch. It tastes just like tabbouleh but without all the work of chopping huge amounts of the herbs. And the whole-wheat pasta and chickpeas of course give it more substance to make it into a main dish for a light lunch. The amount of dressing is perfect. It holds up well in the fridge for several days. I am so glad I found this recipe!!! Thank you SO much!!! I’m so glad you enjoy it Jen!! Let me know if you try any other recipes of mine! So excited to come across this recipe. I’ve missed this salad from TJs, can’t believe they discontinued it. Going to try it out this weekend. Thank you. Oh I hope you love this! I made this and added half a bag of the TJ’s “power greens” — baby chard, baby kale and baby spinach. It’s amazing. MMMM this looks so delicious. I love to have this sort of salad in my fridge to nibble on. Thanks for introducing me to yet another awesome blog Liz! Me too!! I love salads that taste better the next day! Have a great week sista! Oh I love this so hard, Liz!! So fresh, perfect for spring. I know right? I am so ready for Spring foods!! Liz – you were at the finale of The Biggest Loser??? I wish I would have watched!! I bet you had such a great time… I hope you post photos on here! YES!! If you watch the show at some point, I’m sitting right behind Bingo’s family! What a yummy looking salad! I never thought to do the rotini twist on bulgar but I can see how it would work seamlessly as a dish. Clever! I appreciate the ideas for other veggies to add to the salad. I’m always getting stuff in my CSA farm share that I don’t know what to stick in things (for example, radishes–love me some radish sandwiches, but there’s only so many that I can eat, you know?) so I’m glad for the suggestions on ways I can lighten my bursting summer crisper drawer with good flavor. So glad you enjoyed this recipe Kirsten! How long will you be in LA? I have restaurant recommendations for you! Oh my goodness I wish I had seen this!! Although truthfully it was so hard to eat out with our 18 mo on East Coast time!!! We ended up doing Thai takeout in the hotel one night from Cin Cin in West Hollywood- so good! This looks so fresh and healthy! Yum! Same here – and I love anything tabbouleh!! Let me know if you try it!! So true! Thank you Kelly! I love all kinds of pastas. This looks wonderful! Hope you have fun in LA!! Thank you Angie – it was a super fun trip!!! 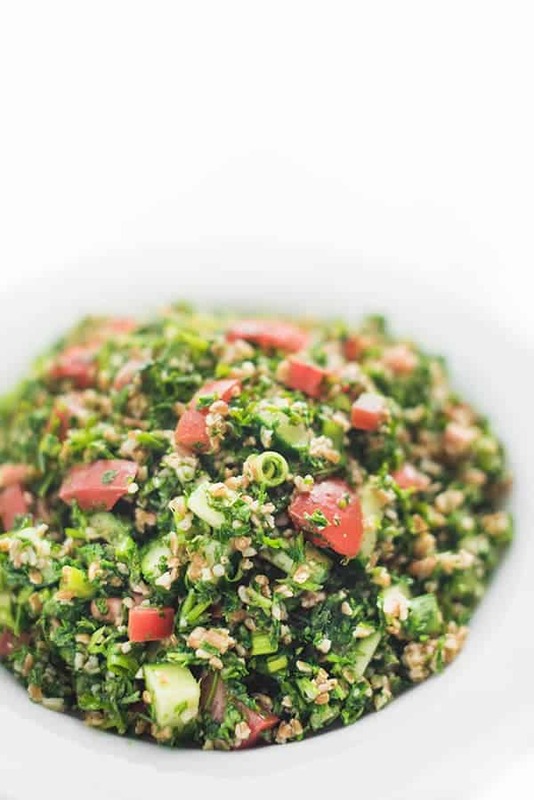 I love the flavors of tabbouleh! Look great! I just pinned it. I’m so happy to see this recipe! I love tabbouleh, but can’t have it any longer because of a gluten allergy. While I can’t have whole wheat pasta either, I can’t wait to sub in some corn or rice pasta and enjoy this beautiful salad. Thanks, Julia! What a great idea for gluten allergies!!! Thanks for sharing! Yum, I love a good pasta salad!